Artist Jamie Ferraioli proves that stunning, feminine accessories are in no way at odds with nerd culture with her gorgeous, hand-painted shoes. 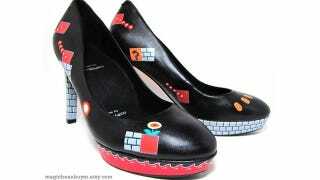 These heels and flats display meticulously detailed hand-painted art from Super Mario Brothers and The Legend of Zelda. My personal favorite part is the lava painted onto the platform sole of the black Mario heels.